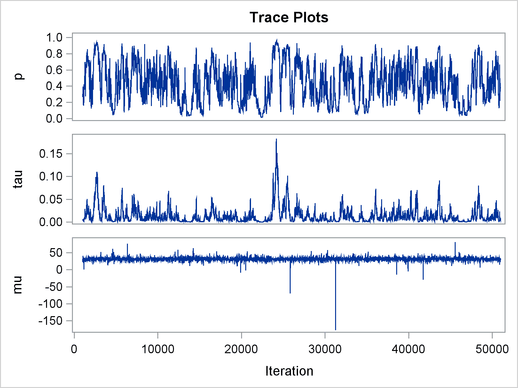 Proper transformations of parameters can often improve the mixing in PROC MCMC. You already saw this in Nonlinear Poisson Regression Models, which sampled using the scale of parameters that priors that are strictly positive, such as the gamma priors. This example shows another useful transformation: the logit transformation on parameters that take a uniform prior on [0, 1]. The total number of parameters in this model is eight: , and . The ODS SELECT statement displays the effective sample size table and the trace plots. The ODS GRAPHICS ON statement enables ODS Graphics. 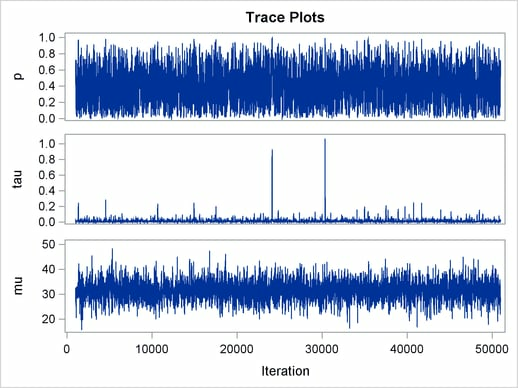 The PROC MCMC statement specifies the usual options for the procedure run and produces trace plots (PLOTS=TRACE). The three PARMS statements put three model parameters, p, tau, and mu, in three different blocks. The PRIOR statements specify the prior distributions, and the programming statements enclosed with the BEGINNODATA and ENDNODATA statements calculate the transformation to taub and tauw. The RANDOM statement specifies the random effect, its prior distribution, and the subject variable. 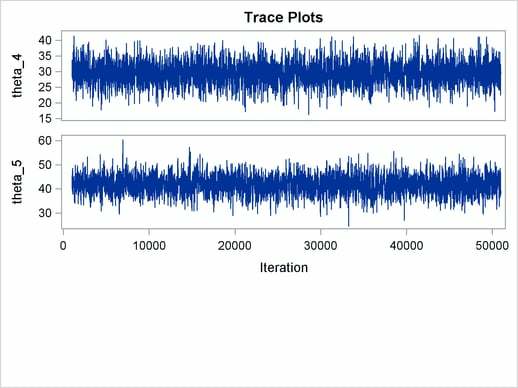 The resulting trace plots are shown in Output 54.18.1, and the effective sample size table is shown in Output 54.18.2. 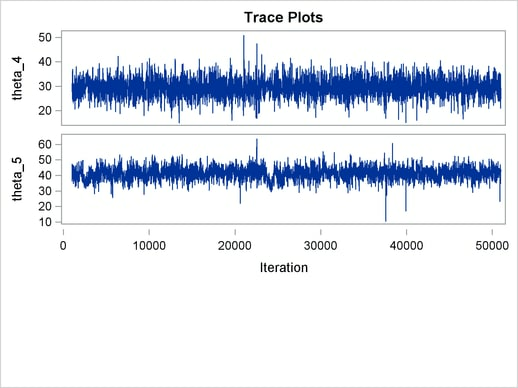 The trace plots show that most parameters have relatively good mixing. Two exceptions appear to be and . 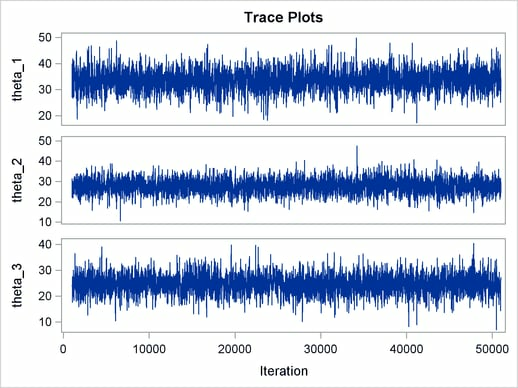 The trace plot of shows a slow periodic movement. The parameter does not have good mixing either. When the values are close to zero, the chain stays there for periods of time. An inspection of the effective sample sizes table reveals the same conclusion: and have much smaller ESSs than the rest of the parameters. The two parameters clearly have a nonlinear relationship. It is not surprising that the Metropolis algorithm does not work well here. The algorithm is designed for cases where the parameters are linearly related with each other. The variable lgp is the logit transformation of , and ltau is the log transformation of . The prior for ltau is egamma, and the prior for lgp is logistic. 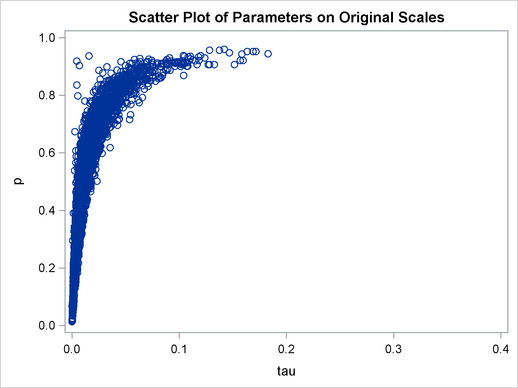 The tau and p assignment statements transform the parameters back to their original scales. The rest of the programs remain unchanged. 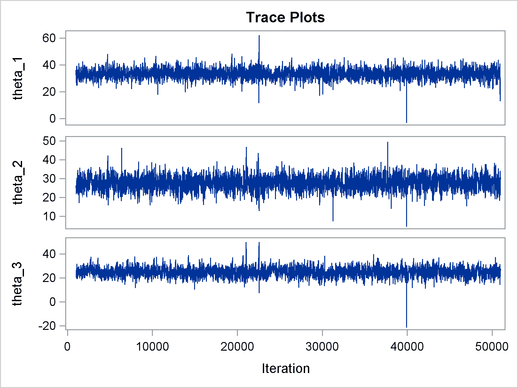 Trace plots (Output 54.18.4) and effective sample size (Output 54.18.5) both show significant improvements in the mixing for both and . 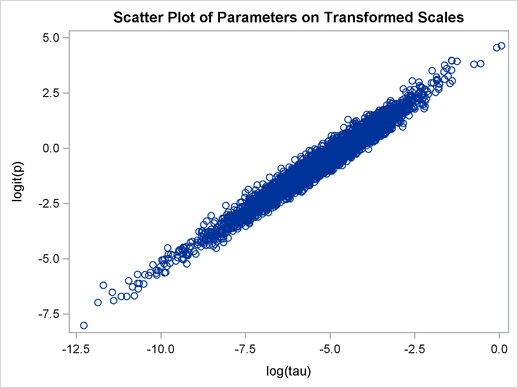 The scatter plot of versus shows a linear relationship between the two transformed parameters, and this explains the improvement in mixing. In addition, the transformations also help the Markov chain better explore in the original parameter space. Output 54.18.7 shows a scatter plot of versus . The plot is similar to Output 54.18.3. 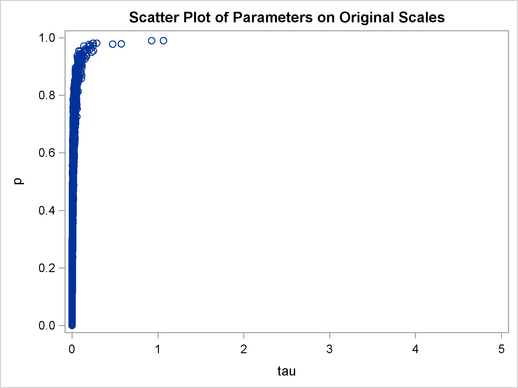 However, note that tau has a far longer tail in Output 54.18.7, extending all the way to 5 as opposed to 0.15 in Output 54.18.3. This means that the second Markov chain can explore this dimension of the parameter more efficiently, and as a result, you are able to draw more precise inference with an equal number of simulations.